The Disability Discrimination Act and specifically Part M of the Building Regulations sets out a standard for the planning and installation of Disabled Bathrooms and Toilet Facilities. 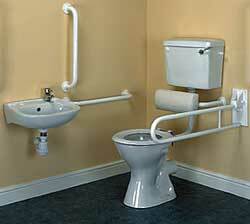 Bennetts stock a wide range of Disabled Bathroom Fittings and Accessories, plus full contractor packs. Bennetts also stock individual bathroom rails and toilet rails in a range of finishes that allow you to tailor the choice of equipment to suit a finish or the physical layout of the room. We also supply a range of Anti-Ligature Washroom Fittings designed specifically for Mental Health Hospitals and Day Care Centres. For Disabled Shower Seating we can supply wooden folding seats or any other finish to match your door handles or colour scheme.